Acquired from the above by Emily Ferrier-Spear, New York, thence by descent to the present owners. 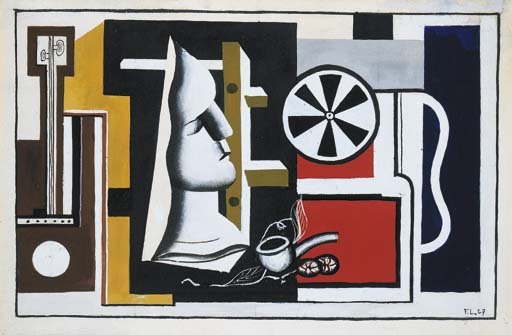 Nature morte au masque de plâtre is not only a rare example of a highly finished and complete gouache version of a major Léger painting of the same title and date (Bauquier 503, see fig. 1), but also a fascinating document of the history of Léger's most famous dealers: Henri Kahnweiler, Alfred Flechtheim and Daniel Saidenberg. By the late twenties, Léger had broadened the application of his formal Cubist/Purist approach to painting, so that it would encompass a wider range of motifs and everyday objects. In such works as Nature morte au masque de plâtre from 1927, much of the preceeding style of the twenties is retained, while the objects represented are not only more recognisable than in the more severely abstracted works from the earlier part of the decade, but also comprise a believable yet arbitrary studio grouping. Formal structure becomes the predominant concern for Léger's work of this time. The present work was first handled by Henri Kahnweiler, Léger's first dealer from about 1912 to the late thirties. In 1920, shortly after the War, Kahnweiler, openened a new gallery in Paris. As a German in a still hostile post-war environment, he named the gallery after his friend André Simon. Throughout the twenties Kahnweiler had a close business relationship with his fellow dealer Alfred Flechtheim in Berlin, who himself was a keen supporter of the French avant-garde, and Cubism in particular. Together with Leonce Rosenberg and Henri Kahnweiler he handled important works by, amongst others, Pablo Picasso, Juan Gris and of course Léger. In 1928 for example, Flechtheim was able to sell Léger's famous L'accordeon from 1926 (Bauquier 454) to the Lausanne collector G.F. Reber. Today the work is housed in the Stedelijk van Abbe Museum in Eindhoven. The present work, after passing through Flechtheim, was sold to the parents of the present owners by the New York-based Saidenberg Gallery. After the death of Curt Valentin, the famed dealer and representative of Kahnweiler's operation in the United States died, Kahnweiler hand-picked the Saidenberg couple to represent Picasso's oeuvre in America. Furthermore, they were also allowed to handle other artist's of the Galerie Louise Leiris, including Fernand Léger, Juan Gris and André Masson. As Eleanore later recounted: "When Kahnweiler said 'everything', it changed everything for us. He sent us Picasso oils, Gris watercolours, everything. It put the gallery on the map."